Home Travel Services Vietnam visa on arrival Visa Service How Much Does It Cost To Get Vietnam Visa On Arrival Totally? Vietnam visa on Arrival is an online procedure for visa application and approval that can be easily carried from the comfort of home. You are no longer needed to queue up for long at the Embassy offices since the online visa on arrival companies will hit the Embassy outlet on your behalf. You are simply needed to fill up the application form from the visa company’s website, pay the service fee online and then receive the visa approved letter on your email inbox. The best visa companies take time to process within 4 to 24 hours to send the visa approval letter to your email. The approval letter would be accredited by the Vietnam Immigration Department. We will send you Vietnam Visa Approval letter with code for picking up visa upon arrival at any international airport in Vietnam (Tan Son Nhat Airport in Ho Chi Minh city, Noi Bai Airport in Ha Noi city and Da Nang Airport in Da Nang city). After receiving Vietnam Visa approval letter through email from us, print it out with 2 passport photos (4x6cm)and bring it along when you travel to Vietnam. Service fee is the cost which you would be paying online as you submit the visa application form. This is the charge needed to grant the Vietnam visa approved letter from the Immigration Department. As you submit the service fee, you will have your Vietnam visa automatically sent to the Immigration control network of the Vietnam international airport -where you are scheduled to arrive. The standard Vietnam visa cost for online service fee for 1 month single entry is around 12 USD which comes to say 19 USD for 1 month multiple entries. If you are opting for 3 month single entry it’s like 25 USD and the Vietnam visa cost for 3 month multiple entries would be around 35 USD. The stamping fee is the charge which you would be paying directly to Immigration outlet at the Vietnam international airport on your arrival. The fee involves the charge for your Vietnam visa on Arrival print-out and the approval stamp on your passport from the Immigration department. The standard stamping fee for single entry (both for 1 month & 3 months) is around 25 USD while it is 50 USD for multiple entries (both for 1 month & Less 3 months). Full 3 months multiple to less 6 moths multiple will be charged 95 USD. The total Vietnam visa cost for Visa on Arrival Vietnam (service fee + stamping fee) would be somewhat like. - 1 month single entry: 12 + 25 USD= 37 USD. - 1 month multiple entries: 19 + 50 USD = 69 USD. - 3 month single entry: 25 + 25 USD= 50 USD. - 3 month multiple entries: 35 + 50 USD= 85 USD. 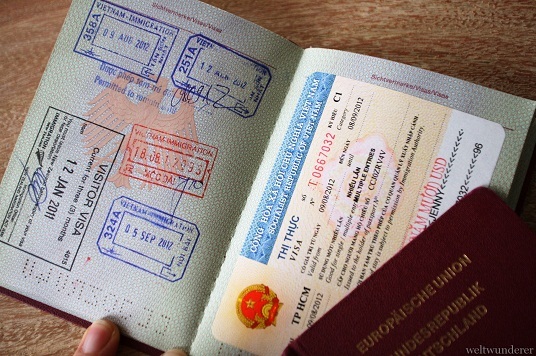 If you are planning for a Vietnam visa on Arrival service, you can take to www.visavietnam.net.vn as it’s one of the most leading names when it comes to Visa on Arrival Vietnam online facility. The company even assures discount for frequent travelers and cash back guarantee on customer dissatisfaction.